Activation is done with a serial number. All our Kontakt-based sample libraries come with a unique serial number: your license. 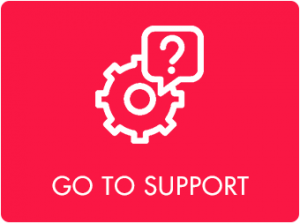 This number is needed to activate the library in Native Instruments Native Access, so that the library appears in Kontakt, Komplete, Maschine and so on. Direct Download from ProjectSAM? No need to register. 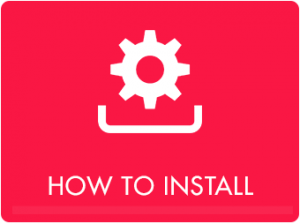 If you purchased your ProjectSAM library as a Direct Download directly from us, you already have access to your serial number. It can be found in your ProjectSAM account, as well as in your order confirmation e-mail. There is no need to register anything and you can continue with activating the library using your serial number. Direct Download from a retailer? Register your challenge code. Screenshot of the challenge code registration field on the ProjectSAM website. 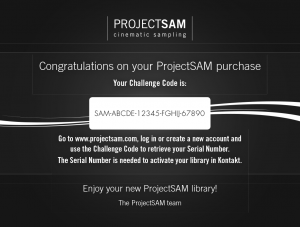 If you purchased your ProjectSAM library as a Direct Download from a third party retailer or distributor, you will have received a so-called challenge code. This is not your serial number. Please submit the challenge code into the challenge-code registration field on the ProjectSAM account page. It will then be converted into your serial number. If you bought a ProjectSAM Pack, it will come with a single challenge code. If you register this challenge code, it will be converted into multiple serial numbers, one for each library in the Pack. If the case of a downloadable challenge code, a full download of the latest version of the library will be made available for you on the Your downloads page. Boxed library? Register your challenge code. Screenshot of the challenge code sheet found in a boxed ProjectSAM library. If you bought a boxed edition of a ProjectSAM library, either from our website directly or from a third party retailer, you will find a black sheet with a so-called challenge code in the box. This is not your serial number. Please submit the challenge code into the challenge-response registration field on the ProjectSAM account page. It will then be converted into your serial number. If you bought a ProjectSAM Pack, it will come with a single challenge code. If you register this challenge code, it will be converted into multiple serial numbers, one for each library in the Pack. A challenge code is only used once. After submitting it, it is automatically disabled. If you have a serial number that is not registered in your ProjectSAM account, and you never had a challenge code to register, please contact us and we will add the serial number for you manually. Once you have your serial number, you are ready to add and activate the library to Native Access.